Our town, 100 Mile House, BC is known officially as the “Handcrafted Log Home Capital of North America”. We are very proud of this title because we know it is partly due to our own contribution of building log homes here since 1969. It also implies, rightly so, that there are many log home builders in 100 Mile House. Our small town has about 13 log home builders and produces approximately 400 handcrafted log homes a year. Sitka Log Homes recently featured a full log house display in two log home shows in Alberta. Most of the other exhibitors were from our area and were people we knew well. It was so interesting to see how everyone interacted with each other. If one company needed a certain tool they’d forgotten, another company was quick to lend it. After the shows we’d share a meal with each other, have some laughs and swap stories. These old friends are also our competition. This got me thinking about “competition” and the log home building industry. Our industry has seen a slump recently with the US housing market all but disappearing, and yet even in tougher times like these everyone is co-operating and practicing healthy competition. Most don’t compromise ethical standards in order to gain an advantage over others. I think this is due to respect. We all respect the hard work and dedication that it takes to remain in this business and so we prefer to compete in a co-operative manner. This is good for the whole log home building industry and what is good for the industry is good for each of us. Healthy competition allows incentives for self-improvement. You can’t help but want to look for new ways to improve what you do when you aren’t the only guy in town offering a service or product. This in itself is helping our whole log home industry evolve. Competition helps to stimulate innovation, encourages efficiency and can help drive down prices so that both the manufacturer and the consumer win. Here’s to an ever evolving log home building industry and all of the hard workers behind it! Congrats on a great posting... it is refreshing to see a company (actually an industry) taking the high road and competing on merit and respect. As you noted, this is not always the case in a "recession" and I salute you and your company for your public stance. Every industry has competition, but like you, I consider ours unique. It will continue to grow and improve if companies such as Sitka Log Homes continue setting the example. 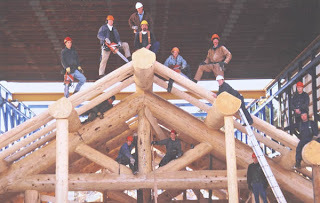 Best to Sitka Log Homes and I will continue to follow your progress as I have done for years. Thanks for the kind words Montana Tom, and especially for your support of our industry. Your Log Home Directory is a valuable resource. By the way, I love your "Log Tip" boxes. Great idea!